As part of the journey to become an insights-driven business, enterprises need to modernize their BI technology and architecture. They need to constantly strive to turn more data into actionable insights that drive tangible business outcomes. One of the key success factor is cloud based data lake which provides highly scalable and elastic foundation for a modern enterprise BI platform. Cloud data lakes are the most transformational of modern technologies, revolutionizing how organizations store, manage, and scale up and down their big data infrastructure. 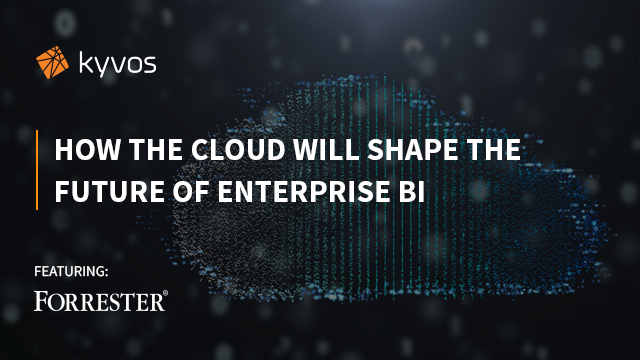 With more and more enterprises moving to cloud for efficiency, reliability, and reduced costs, it is destined to shape the future of enterprise BI. Being one of the largest retail pharmacy chains in the world, Walgreens wanted to leverage their data to optimize supply chain business strategy. To be able to achieve the use cases that will improve supply chain efficiency and reduce inventory costs, there is a need to process 466 billion rows of inventory data and sales data from over 20,000 suppliers and 9,000 stores. Their current systems were strained while dealing with the scale and cardinality of their data, and could not provide timely insights to thousands of suppliers and business users. The visualizations are essential to support the data sharing strategy between Walgreens and their suppliers. In this talk, Walgreens will describe how they use Kyvos and Tableau to analyze two years of historical data instantly and interactively to get deeper insights into their supply chain. Most enterprises today are moving or planning to move their Big Data and applications to the cloud. Cloud not only enables anytime, anywhere access to data, but also offers the benefits of scalability, elasticity, high availability, cost optimization, and more. However, just moving your data to the cloud does not ensure that you will reap all its benefits. The next step should be to move analytics to the cloud and ensure that it is as elastic as the cloud platform itself. With our latest release Kyvos Version 5, you can build an agile, elastic, and high-performing BI on Big Data platform that helps you achieve sub-second response times on trillions of rows of data both in the cloud and on-premise Big Data platforms. Like all telecommunication giants, Bell Canada relies on huge volumes of data to make accurate business decisions and deliver better services. They use BI tools such as MicroStrategy and Tableau to build dashboards and reports that provide actionable insights on key KPIs. However, as their data began to reach Big Data proportions, they started facing technological challenges delivering growing business reporting demands. They knew they had to bring in some architectural changes to meet their business team’s requirements of interactive slicing and dicing. In this session Big Data leadership from Bell Canada will present why they chose OLAP on Hadoop technology to achieve multi-dimensional analytics. With increasing competition and complicated customer needs, companies have to explore innovative ways to deliver personalized experiences and stay ahead in the game. Verizon, one of the world’s largest telecommunications company, has set the benchmark by building a massive multi-dimensional cube to analyze viewership data from its 6 million subscribers, across mediums, viewers, and geographies, and use these insights to power their marketing decisions and enhance customer experiences. Watch this video where Arun Jinde from Verizon presents how his team uses Kyvos to get instant insights on millions of customers through interactive access to 14 months and 12 TB of granular data. Andrew Brust, Analyst - Gigaom Research and Ajay Anand, VP of Products & Marketing - Kyvos Insights, Inc.
More and more organizations are moving their Big Data to the Cloud for agility, elasticity and efficiency. Although this shift has made data storage more cost-effective, many organizations are still struggling when it comes to consuming this data to deliver business results. Is your organization leveraging its cloud investments to get actionable insights? Are your business users empowered to answer their own questions? Do your existing BI tools perform on data at scale? Do you want to learn how you can enable your existing BI tools to work seamlessly with Big Data irrespective of whether it is on the cloud or within the premise? Whether you are planning to move or have already moved your data to the cloud, this webinar will help you understand and solve the challenges associated with BI on Big Data on the Cloud. Yogesh Joshi, Head Of Big Data and Analytics at AIG, Ajay Anand, VP Products & Marketing at Kyvos Insights, Inc.
Watch our video featuring, Yogesh Joshi, Head of Big Data and Analytics, AIG and Ajay Anand, VP Products & Marketing at Kyvos Insights, Inc. where they discuss if OLAP is still relevant in the age of Big Data and showcase various methods for performing iterative, interactive analytics on Hadoop. Watch this video where our CEO - Praveen Kankariya and Ajay Anand, VP Products of Kyvos Insights talk with John Furrier & George Gilbert from Silicon Angle during Hadoop Summit 2016. They discuss how Kyvos is making Big Data accessible, interactive and profitable for businesses worldwide. Vineet Tyagi, CTO, Impetus and Ajay Anand, VP Products, Kyvos Insights, Inc.
Watch this video where we present a blueprint for implementing a modern data warehouse. You can now make migrating from the EDW to Hadoop less risky and delivers faster, cost efficient analytics on your Big Data. Watch this video where our CEO - Praveen Kankariya and Ajay Anand, VP Products of Kyvos Insights are in a conversation with John Furrier, Editor-in-Chief of Silicon Angle at the Hadoop Summit 2015 where they discuss how Kyvos is revolutionizing Big Data Analytics for enterprises by giving them instant access to data at scale. Praveen Kankariya, CEO - Kyvos Insights, Inc.
Watch this video where our CEO delivers an insightful session at the DataWorks Summit 2018, where he explores the importance of having a unified clear and present view of your enterprise data. He also reinstates why a unified view is at the foundation of becoming truly data-driven and enter into the intelligent AI-driven future. Business intelligence (BI) has been at the forefront of business decision-making for more than two decades. Then along came Big Data and it was thought that traditional BI technologies could never handle the volumes and performance issues associated with this unusual source of data. So what do you do? Cast aside this critical form of analysis? Hardly a good answer. The better answer is to look for BI technologies that can keep up with Big Data, provide the same level of performance regardless of the volume or velocity of the data being analyzed, yet give the BI-savvy business users the familiar interface and multi-dimensionality they have come to know and love. This webinar will present the findings from a recent survey of Big Data and the challenges and value many organizations have received from their implementations. In addition, the survey will supply a fascinating look into what Big Data technologies are most commonly used, the types of workloads supported, the most important capabilities for these platforms, the value and operational insights derived from the analytics performed in the environment, and the common use cases. Attendees will also learn about a new BI technology built to handle Big Data queries with superior levels of scalability, performance and support for concurrent users. BI on Big Data platforms enables organizations to provide self-service and interactive on big data for all of their users across the enterprise. Yes, now you CAN have BI on Big Data platforms! Praveen Kankariya, CEO - Impetus Technologies, Inc. and Ajay Anand, VP Products & Marketing - Kyvos Insights, Inc.
Complex and fragmented data systems make it challenging to define a 'single source of truth' for data that provides a comprehensive single view of the enterprise. Enterprises are pushing for higher levels of data integrity that can drive business insights quickly and easily up and down and across the enterprise. Is it possible to achieve a single source of truth across the enterprise? Or is it just an expensive myth? Is the path easy? Or is it a never-ending journey? - Business leaders looking to break down data silos, reduce costs, and optimize business processes. - IT leaders looking to provide a scalable architecture, eliminate vendor lock-in, and increase analytical flexibility for business users, analysts, and data scientists. Ajay Anand, VP – Products & Marketing at Kyvos Insights, Inc.
Kyvos delivers self-service, interactive BI at massive scale with response times 100x faster than other SQL on Hadoop solutions. Our breakthrough technology lets business users visually explore all their data, interact with it effortlessly, and derive meaningful insights instantly to make informed business decisions. Kyvos offers native compatibility with all leading BI tools, Cloud platforms, and Hadoop technologies. Watch our recent webcast to learn how Kyvos delivers unmatched levels of scalability and performance for enterprise-wide deployments. It also highlights the new features and enhancements that we are introducing with Kyvos 4.0. With over a billion risk points a day, and data stored in multiple platforms for different asset classes, the challenge at Barclay’s was to get a daily consolidated view of their risk exposure, and also provide a way for analysts to interactively drill down to transaction level details to identify issues. Watch this video where Chuck Chakrabarti, Vice President at Barclays describes the Big Data architecture they implemented using Kyvos, Tableau and Cloudera. You will also get an insight into how to operationalize big data in your organization, common pitfalls to watch out for, tools and methods that worked and didn’t work for Barclays, and requirements for self-service analytics. Forrester Research data shows that most enterprises are already data-aware – they have built and deployed data warehouses and at least one enterprise BI platform. But being data-aware does not necessarily mean being insights-driven. Are your BI applications providing valuable insights? Are these insights actionable? Are these actions driving tangible business outcomes? With multiple business systems and massive increases in data volume, Adobe was faced with the challenge of building a big data infrastructure that would provide consistent, accurate and instant answers to queries from their executive team and across the business. Existing systems were not able to deal with the scale and granularity of the data, and the requirement for providing response times in seconds. Watch this video where Mark Picone, the Vice President of Information & Data Services at Adobe, talks about how Kyvos helped them achieve Interactive BI at massive scale. You’ll also learn how Adobe built a big data infrastructure that provides consistent, accurate, and instant answers to queries from their executive team and across the business. Many businesses have implemented Hadoop and cloud data lakes to accommodate their ever-growing big data needs and to eliminate data silos. However, most are still struggling to achieve actionable business insights and gain real value from their data lakes. Forrester Research has surveyed organizations globally to identify key problems enterprises face in delivering analytical insights right at the point of business. This webcast features Forrester Research Principal Analyst, Noel Yuhanna, and Kyvos Insights VP Products & Marketing, Ajay Anand. They discussed about the persistent challenges faced by organizations in implementing Big Data analytics projects and how to tackle them going forward. Ajay further discussed how Kyvos customers are solving the biggest challenges of Big Data and democratizing it for business users. Watch this webcast to get tips and best practices for implementing a big data analytics platform. In this webcast we examine the best practices and guiding principles followed by organizations implementing BI on big data. We also showcase the different components of the enterprise solutions that were implemented and the different approaches considered. Here you will learn about components of the solution, including data ingestion, ETL, governance, security, visualization, and key performance metrics and SLA’s for a successful deployment. We’ll also highlight how these companies implemented a BI consumption layer to drive enterprise wide adoption of big data, and the insights their business users were able to derive that had never been possible before. Kyvos is world’s fastest BI on Big Data platform that delivers instant insights on Big Data in the cloud and on-premise platforms. Our breakthrough “Elastic OLAP on Big Data” technology offers high-performing, flexible solutions that allow users across your organization to analyze trillions of rows of data in seconds, using any BI tool that they like. With installations in several Fortune companies, we have revolutionized Big Data Analytics for our customers by delivering insights at speeds that were considered impossible before. Experience the unbelievable speed and unlimited scalability of Kyvos, and see how it can help your organization at kyvosinsights.com/request-demo/.